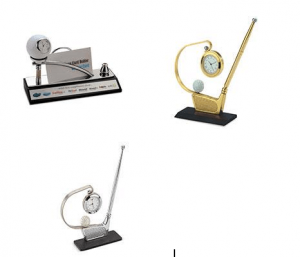 We will keep adding in this series items of higher budgets to help you select the best corporate gifts within your budget. Wooden table top gift set with clock, mobile holder, memo pad, visiting cards and pen holder. 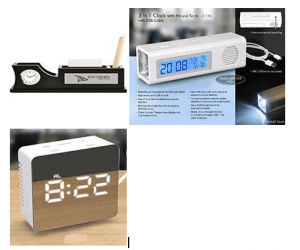 3 in 1 clock with FM and torch: – clock with temperature display, countdown timer, back light, snooze and birthday reminders. FM radio with auto scan, separate volume button and antenna wire for better operations in places with weak signals. For emergencies comes with 3 LED bright torch and works on both batteries & USBs (includes 1-meter USB wire). 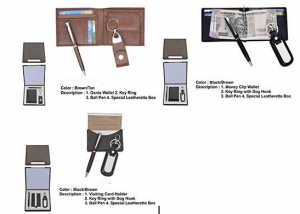 Pure leather gift set of 3 packed in special leatherette box with choice of either multiple card holder, key ring with dog hook and a ball pen or money clip wallet, keyring with dog hook and a ball pen as shown in images below. Pure leather gift set in card board box with ladies & gents wallet with keyring as shown below. Choice of antique leather with gent’s wallets and cardholder as set of 2 in a card board gift box. Leatherette gift set of 3 packed in special leatherette gift box with choice of either gent’s wallets, key ring and ball pen in brown and tan colour as shown below or with money clip wallet, key ring with dog hook and a ball pen with choice of black or brown colour. Finally, you have another choice of replacing the money clip wallet with visiting card holder. 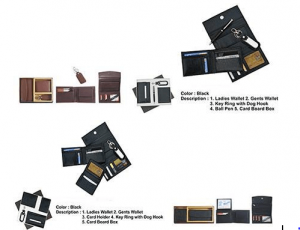 Leatherette gift set for couples packed in card board box with ladies and gent’s wallet with keyring as gift set of 3. Gift set of 4 includes a set of wallets for couples in a card board gift box as shown below. Along with wallets for couple you can add key ring with dog hook and as 4th choice can go for either a pen or visiting card holder. Option of selecting gift set of 2 as ladies’ clutch purse and a gent’s wallet. 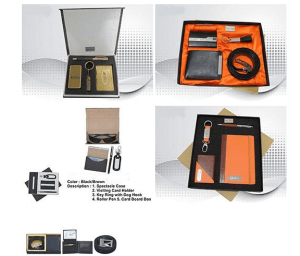 Gift set of 4 items in card board box with pen, keychain, visiting card holder and paper weight in gold colour or choice of wallet, visiting card holder, belt and keyring as shown below. In black and brown colour gift set with spectacle case, visiting card holder, keyring with dog hook & roller pen or gift set with pocket diary, visiting card holder, keychain with dog hook and pen. Gift set of 2 consisting of gent’s wallets and belt. 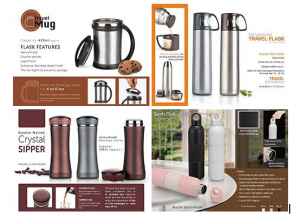 Travel mug with stainless steel finish, vacuumed, doubled wall, leak proof with air tight lead to prevent spillage with beautifully designed handle for an easy grip keeps the 420 ml beverages warm from 4 to 6 hours. Double walled 500 ml vacuumed Travel Flask comes in choice of 2 colours with half turn mechanism for pouring in cup to prevent spilling during journeys while retaining temperature for 12 to 16 hours. Double walled 350 ml vacuumed Crystal Sipper comes in choice of 2 colours with luxurious look due to beautiful crystal finish on the lid. Its compact size makes it easy to carry in a small bag while retaining temperature of hot or cold beverages for 24 hours. Sports Flask which can be carried like a sipper, made of high quality food grade 18/8 stainless steel, double insulated, vacuumed to keep beverages hot till 12 hours and cold up to 24 hours. Designed to fit easily in car cup holders with bubble grip silicone sleeve on the body for a better grip is available in 3 colours namely white, black and pink with capacity of 600 ml. at office, car or at home keep your beverage hot for long hours due to 12v socket which also converts into a USB plug, making it suitable for use with computers, power banks or electricity. Mug comes with double wall for convenient holding and when plugged through USB port keeps hot beverages hot and when used in car is powerful enough to even make your cold beverage hot! Auto cut off Electro Power electric lunch box comes with 3 containers which are made of food grade plastic, hygienic, odourless, stackable, reusable, microwaveable & refrigerator friendly. Auto power cut off prevents over heating while durable heat resistant plastics ensures long term use. Comes with shock proof mechanism with constant heat for safety of heater as well tiffin while consuming very low power to make the food hot within an hour. 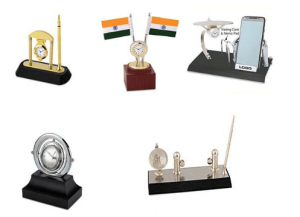 Brass table tops with mix of wooden base in gold and silver finish as shown below with clocks, pen stands, flags, visiting card holder, mobile holder, pen holders and various concepts. 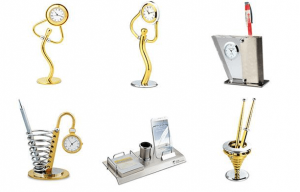 Brass table top in metals in gold and silver finish as shown below with clocks, pen stands, visiting card holder, mobile holder, pen holders and various other concepts. Brass table tops with golf concept in gold and silver finish with wooden base as shown below. 4 layer toiletry kit with detachable bag for medicines etc. stores all your daily need products and folds into a compact pouch, can be hanged when open for easy accessibility with clear pockets to see all items and keep different things as per partitioned pockets. Easy to carry, ultra compact when folded, cabin size compliant, round Foldable Duffel Bag made of high quality imported denier with two compressed foam side panels for a sturdy look. Keeps you organized with one main compartment and a zipper pocket outside as shown below. Please feel free to get in touch with us for your specific requirements for promotions so that we can create a customized offer as per your brief.